"...watching her play...I got to accept that she is no longer a baby." - msn message to may-yi. observing you the past week leading to your birthday, mama is so comforted. it was not like how i imagined it to be. it is blissful to see you grow, learn and enjoying yourself. 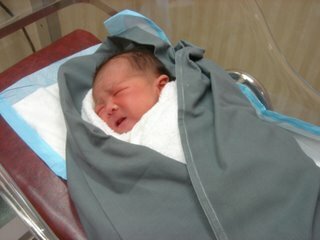 11 may 2005, 09:29 (GMT + 8:00) 3.55 kg, 47cm long, 35cm head circumference. you were born. "hello..." that was the 1st word you heard, from dr k.l. yam. before you broke out a loud hearty cry. ''look, baby eyes are opened" i stretched my neck a lil' and saw your face. what a beautiful child in dr yam's hands. after cleaning you (just a little) the nurse brought you to me. like in the movies, with the op theartre lights flooding, i met you up-closed.
" i know, i know...don'y worry, mama will protect you," i said to you. you were crying. i gave you a kiss on your head, the nurse carried you to papa. i could hear you wailing ...wee wee wee all the way down the hallway. tears swelled when i read your silly little blog made especially for ms sarah ang, esp this one.sweet soft and special.she's just so lucky to have you as her mum, i thought. lucky sarah sarah so lucky and....blessed. God bless your kind heart and tender loving mother's care.